Rick Dulock speaks with Graham Ellwood, a standup comic and organizer of Custer's Last Standup. That's live indigenous standup in San Bernardino being filmed for a series coming soon to FNX TV, First Nation's Experience. The rest of the show remains funny, but now it's David Fleming in conversation with Bruce Belland, of the Four Preps. The Four Preps are part of a six act lineup with The Chantels, Lala Brooks, The Skyliners, The Marcels, and The Mystics. 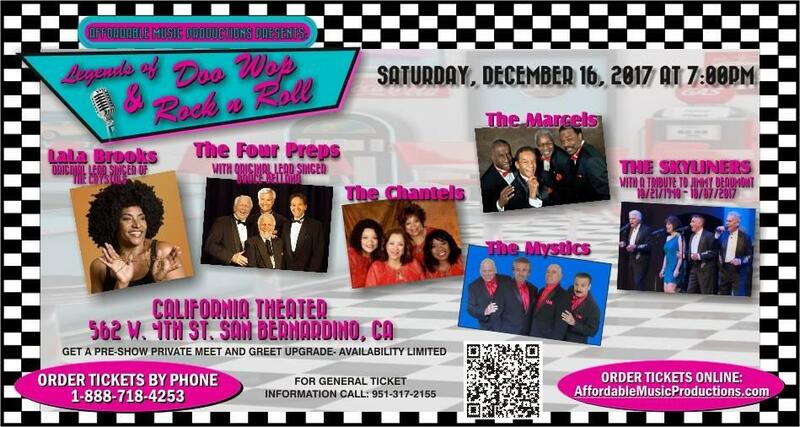 That's "Legend of Doo Wop and Rock n' Roll" at The California Theatre in San Bernardino December 16th. Affordablemusicproductions.com for tickets and information. Emmanuel Rogers speaks with Dale Brown about his new novel – Iron Wolf – continuing the story of Brad McLanahan, and the conflict in the Ukraine. We’ll also get music from The Drifters, and conversation with Charlie Thomas – with the group for their BIGGEST hits. Charlie and the Drifters will be appearing with The Skyliners, and the Marcels in Upland in the very near future.